Winter is in full swing the mitten-shaped state of Michigan. It’s the perfect time to hit the slopes or trails and enjoy Michigan’s many winter sports from sledding and snowmobiling to skiing and boarding. 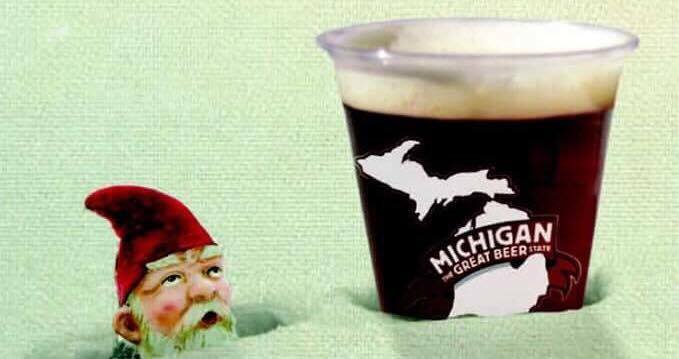 While you’re enjoying the snow-filled days, we recommend these Michigan-brewed winter-themed beers. Bell’s Brewery in Kalamazoo serves Winter White Ale (5% ABV | 21 IBUs). This Belgian-style white ales is a lighter flavorful alternative to the traditional heavy winter brews. There is a blend of barley & wheat malts creating a mixture of cloves and fruity aromas, without all the extra spices. This brew has a cloudy appearance, creating a white winter storm for your tastebuds. Brewery Vivant brews Ski Patrol (6.1% ABV | 8.8 IBUs). This slopes-inspired beer is perfect for Michigan winters, with a golden color and warm spice smell. This beer is accented with an orange peel creating a soft warmth that is needed on a cold winter day. Kuhnhenn Brewery in Clinton and Warren township serves up Metry’s Winter Lager (7.2% ABV). This high-gravity lager is a December draft release, making it a winter favorite. The light grainy aroma balances with a clean finish. There is a hint of alcohol heat reminding you of the beer’s strength, and creating a nice warm feeling perfect for a cold wintery day. New Holland Brewing Company in Holland brews Cabin Fever Brown Ale (6.5% ABV | 25 IBUs). This beer has a toasty, smooth drinking brown ale, making it a hearty companion for long, snowy winters. There is a rye, roast and raisin notes leaving a subtle caramel sweetness and a dry finish. North Peak Brewing Company in Traverse City introduces a new style of IPA, an East Coast IPA called Stormy (6.7% ABV and 35 IBU). This beer is full of haziness along with dry/late hop additions to create a juicy mouth feel with citrus, piney notes unlike any other IPA, making it a perfect beer for the wintery stormy weather we get here in Michigan. Stormy’s character is depicted by an underwater panther deep in Lake Superior. A mysterious creature with a body of a wild feline, horns of a deer, a scaled back and a tail so long it wraps around its body ending with a fish tail. With a warning hiss like the sound of rushing water, the underwater panther lives as protector of the vast amounts of copper in the Great Lakes. It’s been said that anyone who tries to steal copper from the lakes has grave misfortune befall them. Strangely, the metal has been found on numerous Great Lakes shipwrecks. Perhaps a mere coincidence, but it might behoove you to carry nothing of copper aboard your ship when crossing the Great Lakes. Right Brain Brewery brews Fire Starter Chipotle Porter (5.9% ABV | 23 IBUs). The flavor is chocolate and smoky with a spicy kick similar to Mexican Mole sauce. This January release is just in time to keep you warm through the winter months. Rochester Mills is serving Winters Bock (6.5% ABV | 20 IBUs) This is a German Bock Style Lager, a robust malt. The color is a bright amber with a medium body, this is a easy drinking beer. A good beer for Michigan’s hard winters. Rockford Brewing is serving Shanty Warmer (10% ABV | 65 IBUs). This brew has a an intense rich and bold flavor of an imperial stout. You mouth with experience flavors of molasses, bittersweet chocolate and dark caramel with hints of prune, licorice and raisin. This beer will keep you warm in your shanty on Michigan’s inland lakes, or while you enjoy it from the comfort of your home. Saugatuck Brewing Company in Saugatuck serves up Snow Wizard (7% ABV | 25 IBUs). The beer is an Oak Aged Imperial Brown Ale. The taste has woody flavors, like oak. The brown base malt has a caramel, coffee and chocolate body with a hint of bitterness. Snow Wizard has a complex flavor profile of the oak chips, sweetness, and a pinch of hops, giving it a rich winter feel that is sure to keep you warm. Shorts Brewing Company in Bellaire produces Neon Snowsuit (5.9% ABV | 25 IBUs). This deep black color beer is a deceptively light-bodied lager. There is a creamy mouthfeel that is enhanced by notable dark chocolate and espresso flavors with a brief cocoa bitterness. Perfect for a long day on the slopes or as an end-of-the-day warm up beer while you relax in a hot tub. What is your favorite #PureMichigan slopeside beer? Share your thoughts with us below! Caroline Cousineau is a recent Ferris State University graduate with a degree in Public Relations. She is serving a year with the Americorps and Advise MI as a College Adviser for high school students.